The contract is worth nearly a quarter of the Russian state arms exporter's entire sales last year, which were put at $7.4bn. 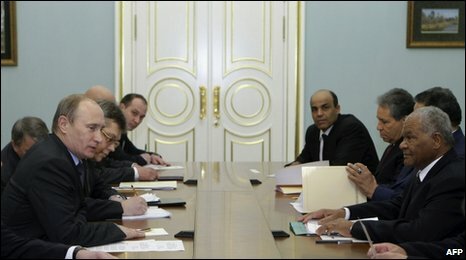 Abu Bakr Yunis Jaber, Libya's defence minister, has been in Moscow for several days, meeting defence officials. "Yesterday a contract worth 1.3bn euros was signed," Mr Putin announced at a meeting near Moscow with the director of the Russian small-arms manufacturer Izhmash, which makes the Kalashnikov assault rifle. "These are not just small-arms." Rosoboronexport, Russia's state-owned arms export monopoly, announced on Thursday that its 2009 sales had seen a 10% increase on the previous year.